I love good sandwiches and Malibu Kitchen has amazing wraps and sandwiches. It’s a tiny, cute market in Malibu Country Mart on Cross Creek Rd. right off PCH (Pacific Coast Highway). They have amazing goodies from cheeses, wine and fresh baguettes, to candy and a fresh bakery with amazing desserts. 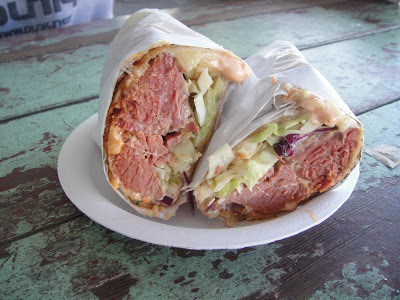 But I go for their deli-they make BOMB wraps. Today, I went on the most beautiful hike in Malibu with amazing waterfalls and after building up an appetite, decided to stop at Malibu Kitchen for one of their delicious wraps. They ran out of pastrami today, so ordered their homemade corned beef, which was just as amazing.